We all love the smell of hot freshly baked bread coming straight out of the oven, filtering our kitchen and our house on a lazy Sunday morning. When baking this homemade bread, we also like it to be as light, fluffy, and airy to perfection as possible. You can indeed bake these light loaves which are just as aromatic and delicious as any local bakery can. The secret is using the best quality ingredients as possible, and then the proper baking techniques to get it to rise rise properly. It’s been discovered as revealed by the finest of professional bakers on what the core factors are that they use themselves, their secrets of baking that fine light airy bread instead of something that’s heavy and dense. The following steps are easy to follow and structure, making you proud of being a better bread baker while using no preservatives. The dough will then rise to the top. What most don’t realize is that yeast is an actual living organism, and like anything that’s living, it needs to have the proper environment for it to grow and then multiply to perfection. Once the yeast is in it’s ideal environment it will begin to expand, setting a chain reaction as it produces carbon dioxide gas, which is the trigger which lifts the dough. What this then creates is that desired airy structure that’s found in delicious freshly baked aromatic bread. Yeast can become extremely sensitive when it comes to temperature. Even just a 10 degree difference in temperature of the dough can affect its growth rate. The exact temperature where the yeast is known to expand the best is 78 degrees, or 25.5 Celsius. The temperature of the dough is also directly influenced by the temperature of the water that’s used. Other influences includes the temperature in the kitchen, the temperature of the flour being used, and the length of time that you mix the dough. Note: The length of time mixing the dough effects the temperature since doing so creates friction, which as a result raises the temperature of the dough. The temperature of the water should be approximately 105 to 115 degrees (40.5 to 46.1 Celsius), and once mixed with the cooler flour, should create a dough temperature of around the desired 78 degrees. o When using a bread machine, cooler water is used and the reason for that is because of the warmer and closed environment which the bread machine provides, making up for the heat. If you’re wanting to be the best technically sound bread baker, it’s advised that you use a thermometer. Make sure that you carefully gauge the temperature of the water as it influences the yeast. The professional bakers are known to precisely gauge the water temperature to a 1 degree accuracy. You’ll also need to use the thermometer to check the temperature of the dough, as well as the temperature of the bread loaf once it’s baked, this to make sure it’s done. The longer that you allow the yeast to fester, the more gas that’s created. In a perfect environment, what yeast does is it doubles in size, and then doubles again. The bread is considered ready for the oven to bake once it has initially doubled in volume, becoming soft and thus full of gas. When in a cooler kitchen, it may take longer to rise. o If using a bread machine, the bread will begin to bake once the timer goes off, regardless if it has properly risen or not. This since the timer on the bread machine can’t be manipulated. The growth of the yeast is controlled by using other optimizing factors once the bread begins to bake. The quantity of the yeast itself which is used can make a difference. Usually, a novice baker will control the rise of the bread along with other factors, but won’t bother changing the quantity of the yeast. When in a cooler environment, what you’ll want to do is slightly increase the amount of yeast, while reducing it in a warmer environment. The dough needs to be soft and flexible for it to rise properly, which is a factor of how much water is used and contains in the dough. If the dough happens to be stiff, it then becomes difficult for the gas to expand so it can lift the dough while creating volume. After the dough is kneaded, the texture and feel should be soft and close to being sticky. The general rule when it comes to mixing bread is to error on the side of adding a bit more water. The softer that the dough is will result in it rising quicker than when the dough is stiffer and heavy. o When using a bread machine, a stiffer dough won’t rise properly once it begins to bake. One easy adjustment that you can make is adjusting the amount of water by using one tablespoon increments. What salt does is it kills the active yeast, so if the dough contains too much, it will then impede the natural growth of the yeast. So even if you add just half a teaspoon of salt too much in the recipe, that can make all the difference. It becomes critical that you measure out the salt as carefully as possible. If you’re wanting to speed up the rise of the dough, you can reduce it by half a teaspoon, or add the same amount to slow it down. o If using a bread machine, it’s considered critical. When it’s sitting on the counter ready for the oven, it doesn’t make that much of a difference. It’s also thought that the actual flavors which are trapped in the bread dough will improve with age. 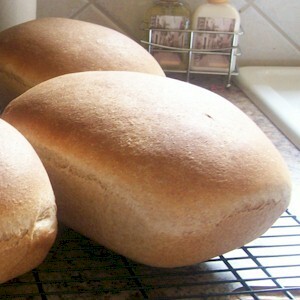 A longer, slower aged bread dough is known to bake into a better bread. So hopefully you can now completely understand what’s going on inside the dough itself and why it bakes to its plump perfection. So happy bread baking.